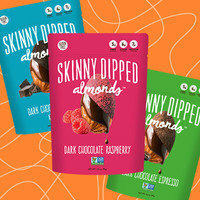 These aren't your average chocolate-covered almonds! Each nut is covered with a thin layer of chocolate and dusted with an extra layer of flavor. Available in Dark Chocolate Cocoa, Dark Chocolate Espresso, and (the HG favorite) Dark Chocolate Raspberry. Seriously, these are the best nuts we've tried in a long time! Find them in stores nationwide, or order online. They even come in 1.5-oz. snack packs and mini 60-calorie pouches! Artichokes are excellent -- low in calories, high in nutrients, super yummy, and fun to eat -- but prepping them can be a bit time consuming. 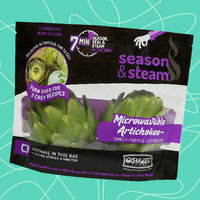 Lo and behold, we found these convenient 'chokes, which are trimmed and ready to cook in the microwave. Nice! We'll be enjoying ours with salsa... or maybe light butter and a sprinkle of garlic! Find Ocean Mist products in the produce section of supermarkets nationwide (Roundy's, Save Mart, Smart & Final) and at Target locations. 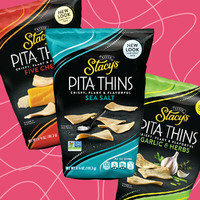 We've always loved pita chips, but it's easy to go crazy with them and totally overdo it. Hooray for these skinny versions, which allow us to snack on MORE pieces! Chow down on Sea Salt, Five Cheese, and Garlic & Herbs varieties... Your upcoming party needs these on the snack table! Click to locate. Amazon Deal of the Day: An Additional $5 Off Hungry Girl OBSESSED! This is HUGE. The awesome folks at Amazon are offering $5 off the (typically already discounted!) price of our latest HG cookbook, CLEAN & HUNGRY OBSESSED! All-Natural Recipes for the Foods You Can't Live Without. Perfect as a holiday present or gift to yourself, this bestseller is CRAMMED with healthy meals, snacks, appetizers, and desserts that are as easy to make as they are delicious to eat. We're talking comfort-food classics, fast-food swaps, impressive party foods, decadent chocolate treats, Chinese and Mexican food makeovers, and MORE... All under 375 calories per serving! Pass the snacks! Click "Send to a Friend" right now.